Driving is the way to go. Literally. It’s how most of us get to work, the grocery store, and everywhere else in and out of Hamilton. Fortunately, it’s easy to buy your own car once you get financing — just apply for a car loan online and get approved in 48 hours or less. Qualify for a loan even with bad credit or no credit. Access to Hamilton’s best auto loan rates. I just moved to Hamilton — can I still get a car loan? Yes. If you’re a licensed Canadian resident and you meet our other requirements (18 or older with a monthly income of $1,500 or more), we’ll be happy to set you up with an auto loan. Can I use my car loan at any Hamilton dealership? No. You can only use your loan to purchase a car from the Hamilton dealership that’s providing the financing. Once you’re matched with a dealership, you can shop from a range of vehicles on their lot. For a more detailed list of mandatory disclosures, check the Ontario Motor Vehicle Industry Council (OMVIC). Ideally, as little as possible, but it depends on the details of your loan. Your loan amount and interest rate will both impact the amount of interest you’ll pay. Choose the car loan term you’re most comfortable with. Generally, you can go with a loan as short as 24 months or as long as 96 months. Just remember that long car loans are more expensive than short loans. Here’s why: as the length of your car loan increases, so too does the amount of interest you’ll have to pay. 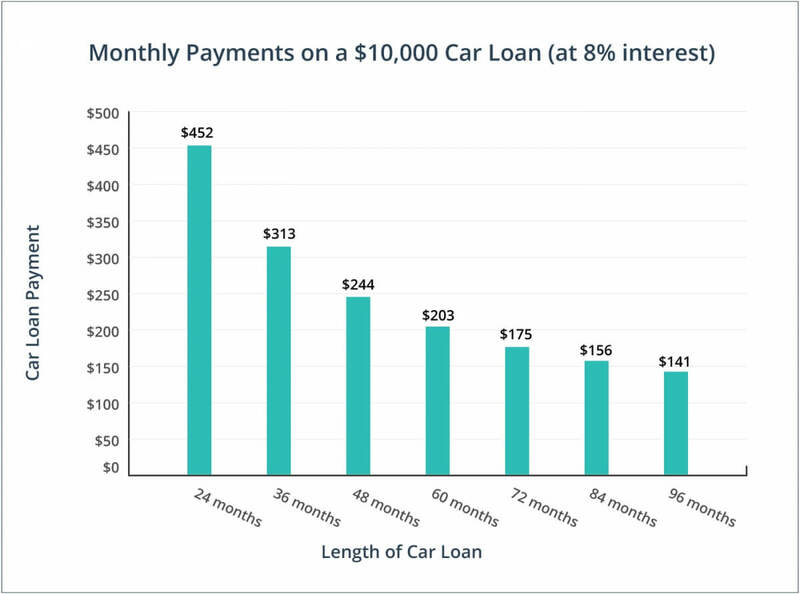 Take a look at our graph below to see what we mean: longer loans mean smaller payments, but add those payments together and you’ve spent nearly $3,000 more on a 96-month loan than on a 24-month loan. If you can afford bigger monthly payments right away, a short car loan is a smart move — you'll pay less interest. And there's another benefit: you'll also quickly eliminate your car loan debt. Do a walkaround during the day, looking out for rust, dents, or evidence of past damage. Then take the car to a Motor Vehicle Safety Inspection Station and get a professional inspection. Get all the details on your (potential) new car and on your car loan before you commit. For example, ask about the fees included in the price, any damages the car may have sustained, and the conditions associated with your loan agreement. How much is this car really going to cost you? Remember: your monthly auto loan payments are just a fraction of your total car ownership costs. You need to look at how those payments add up and then factor in other expenses, like car insurance and gas. I shouldn’t get a car loan unless it’s from a bank. False. If you need help affording a vehicle, a bank is only one option, and it may not be your best one. Banks are less likely to work with borrowers that have bad credit, so if you’ve had financial setbacks in the past, our car loan service is probably the better fit. After all, we work with dealerships that specialize in car loans for Hamilton drivers with bad credit or no credit. Bad credit car loans always have really high interest rates. False. The interest rates can be high, but that’s definitely not always the case. Your interest rate is based on your financial profile and you can work closely with the dealer to settle on a rate that you’re both comfortable with. Hamilton car sales are final, so there’s nothing I can do if something goes wrong with the car I just bought. False. Fortunately, there’s a bit of workaround. If the issue was the result of a detail the dealer failed to disclose — for example, maybe the dealer didn’t reveal that the car was rebuilt — you can cancel your contract. Just make sure you do so within 90 days of buying your car. It’s better to buy from a private seller than from a Hamilton dealership. False. That’s especially not the case if you need auto financing. Buying from a registered Hamilton dealership has two major advantages: you can get a car loan and you can fall back on consumer protections — you’re only protected by the Ontario Motor Vehicle Industry Council and the Motor Vehicle Dealer Act when you buy from a registered dealership. Registered Hamilton dealerships have to advertise all-in-pricing — it’s the law. The price tag should include everything, from the cost of the car to the freight and admin fees. With over 20 HBADA (Hamilton Burlington Automobile Dealers Association) dealers in Hamilton, you’ll have no problem finding a registered dealer nearby. 76% of Hamilton commuters drive to work. That means over 240,000 cars hit the roads daily during the workweek. Hamilton is getting charged up. By mid-2017, the city will be home to three electric vehicle charging stations.